The Siesta Key Association’s October guest speaker is Jon Thaxton, the former Sarasota County Commissioner and multigenerational Sarasota native who grew up in Osprey. Thaxton now serves as a Senior Vice President with Gulf Coast Community Foundation. Thaxton will discuss the means and methods to reduce human contributions to red tide. The discussion will cover the FL agreement crafted through the 5 Water Boards re Waste Water for all of Florida (2010). This is a great opportunity to have historic reference and statewide plan that somehow was ‘scuttled’. The meeting is at St. Boniface Church at 5615 Midnight Pass Rd. Thursday Oct. 4 at 4:30 pm. Davidson’s Drugs celebrates 60 years in business. On Tuesday Oct 2, Davidson’s Drugs will be offering 25% off on every item in the store, see page 2 of this edition for details and exclusions. Join Blase Cafe for their 21st Halloween party Saturday, October 27 at 8 PM. Prizes for best costume, live funk and soul music with T Bone & Ambidextrous. “Blase Cafe knows how to throw a party” See if you can identify co-owner Kevin. Come have a spooktaculer evening, 5263 Ocean Blvd, 941-349-9822. Richard and Barbara Posner, along with their dedicated crew, would like to thank their loyal customers for their support and friendship in their 15 Years of business in Sarasota. They have been making and baking some of the finest Meat Pasties, Pork Pies and Sausage Rolls in the USA. 4 & 20 Pasty Company carefully selects a variety of British groceries, Cadbury’s Chocolates, lean back bacon, pork banger sausages, black and white puddings, scones, clotted cream, imported jams and lots more. 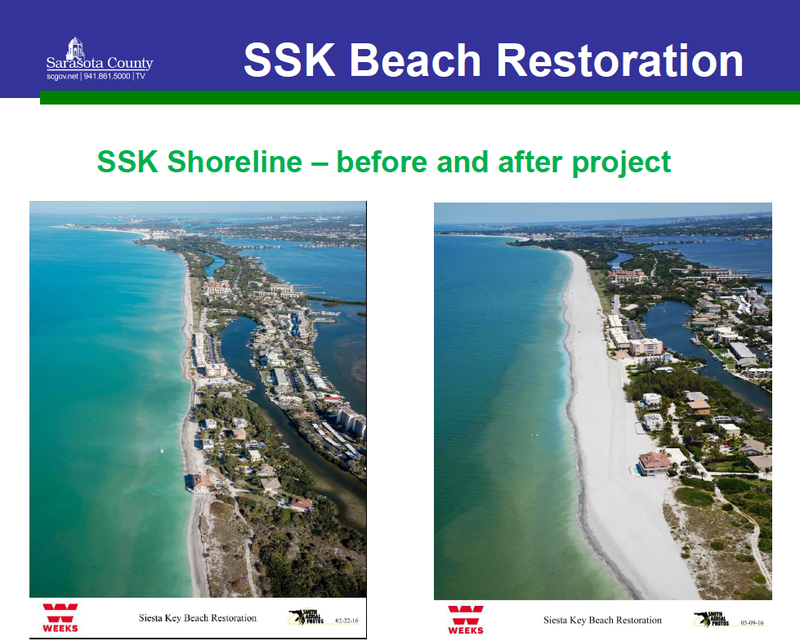 Although it has been close to two-and-a-half years since Sarasota County completed the second renourishment of South Siesta Key Beach, the County Commission has authorized staff to apply for more state funds to help pay for facets of that project. As part of their unanimous vote on their Aug. 28 Consent Agenda of routine business items, the commissioners approved the submission of the necessary documentation to the Florida Department of Environmental Protection (FDEP) for its consideration under its Fiscal Year 2019-2020 Beach Management Funding Assistance Program. The first renourishment of the southern portion of Siesta Beach was completed on April 30, 2007, a staff memo explained. In 2011, the commissioners directed the county administrator to begin the process for Phase II, which began on March 9, 2016, the memo added. That work was completed in May of that year. The county already won FDEP grants of $2,750,000 in 2015 and $5.9 million in 2017 for Phase II of the South Siesta Key Renourishment Project, the memo noted. “FDEP notified the County that grant award documents are being prepared for an additional $82,620 award in 2018,” the memo said. “Further, the County can still request additional eligible funding for up to three years following construction for other eligible expenses, including post-construction monitoring,” the memo pointed out. The FY 2019-20 request is for $94,600, the memo said, which would cover the state’s portion of the annual monitoring costs required by the project permit. The memo added that project monitoring costs not covered by the state funds would be paid for by Tourist Development Tax revenue set aside for county beach renourishment initiatives. As Siesta resident Mike Cosentino argued points with the county commissioners during the Aug. 29 public hearing on his proposed Sarasota County Charter amendments, he referenced the vacation of part of Calle de Costa Rica in 2013. Based on the testimony that day, Commissioners Charles Hines, Joe Barbetta and Carolyn Mason voted in favor of the road vacation. Commissioners Nora Patterson and Christine Robinson voted against it. That is the same policy that Cosentino has claimed the County Commission violated in vacating part of North Beach Road. Later in 2016, during a revision of the Comprehensive Plan, the policy was amended to give the board more leeway in road vacation decisions affecting property on waterfronts. In 2013, the Calle de Costa Rica right of way was turned over to the Baumanns and the owner of the property on the other side of the right of way, DCA Fidu Inc. Trust Estate. A check of the county records, which clearly shows regarding the May 21, 2013 County Commission meeting, that this issue was the focus of a public hearing. Cosentino also did not appear at the North Beach Road vacation public hearing in May 2016. He said afterward that he never expected the commission would approve that petition. How long is that segment of North Beach Road? 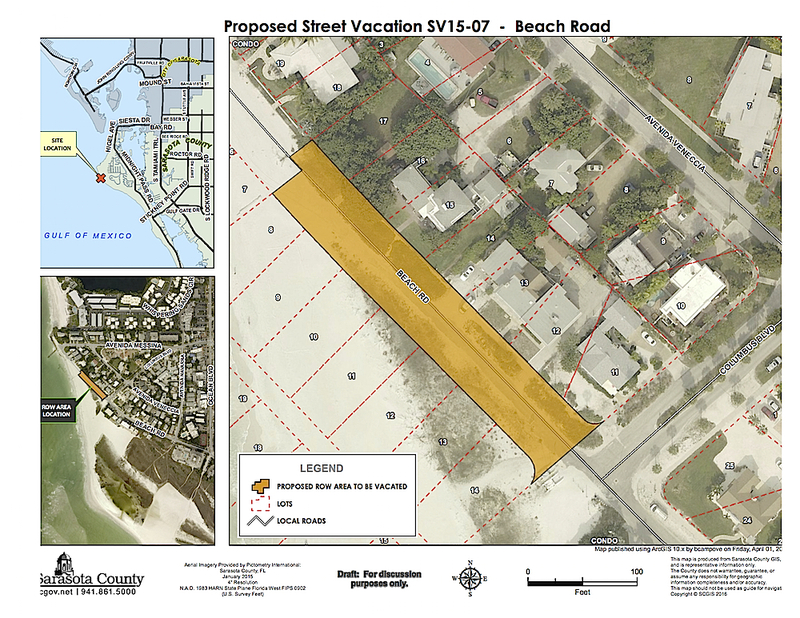 During the Aug. 29 County Commission public hearing on whether two proposed amendments relating to a vacated segment of North Beach Road would be placed on the Nov. 6 General Election ballot, a question arose about the length of the segment, as noted in language drafted by the Office of the County Attorney. When Commissioner Charles Hines asked County Attorney Stephen DeMarsh for an explanation, DeMarsh said that 224 feet was the distance determined by a survey of the portion of the road that was vacated. As a result, DeMarsh explained to the commissioners on Sept. 11, the distance has been determined to be 373 feet. That number will be included in the ballot question related to the Charter amendment seeking to return the vacated road segment to county possession. During Aug. 29 public hearings on proposed amendments to the Sarasota County Charter, Siesta Key resident Mike Cosentino took several opportunities to remark on his disappointment in losing the Aug. 28 Democratic Primary for the District 4 board seat. Finally, after the third public hearing stretched on until about 5:45 p.m. on Aug. 29, Commissioner Alan Maio — who won the Republican Primary the previous day in an effort to keep the District 4 seat — offered a couple of comments. Commissioner Paul Caragiulo confirmed that. Maio noted that he lost one precinct by about 100 votes and the other, by 24. The results were still unofficial at that time. His opponent in the Aug. 28 Primary was the same opponent he faced in the 2014 Republican Primary, Siesta resident Lourdes Ramirez. When Siesta Sand reviewed the official election results on Aug. 31, it found that Ramirez beat Maio 700 votes to 563 in Precinct 133, which is Grace Baptist Church, located at 8000 Bee Ridge Road. She also defeated him in Precinct 411, which is St. Boniface Episcopal Church on Siesta Key. She had 350 votes to Maio’s 323. As for Cosentino and his opponent in the Democratic Primary, Wesley Anne Beggs of Sarasota: Cosentino also prevailed in only two precincts: 411 at St. Boniface, where he garnered 225 votes to Beggs’ 211; and in Precinct 401 at Siesta Chapel on the north end of Siesta. In the latter precinct, Cosentino won 26 votes, while Beggs had 22. Whither the Big Pass buoys? Catherine Luckner, vice president of the Siesta Key Association (SKA), recently questioned why buoys marking the channel in Big Sarasota Pass remained missing well into the summer. In an Aug. 3 email she sent to Commissioners Charles Hines and Alan Maio, she pointed out that the SKA had been fielding questions about the buoys’ continued absence. “We’d greatly appreciate County effort to restore recreational boating safety assistance,” she wrote. Along with the Siesta Key Association (SKA) on Sept. 6 and the Siesta Key Chamber of Commerce on Sept. 7, LeLu Coffee Lounge in Siesta Village hosted an informational meeting about red tide, as business owners and residents have continued to deal with its negative effects. On Aug. 29, LeLu’s and the Surfrider Foundation Suncoast Chapter provided a presentation by Ray Judah, a former environmental land planner with the Lee County Department of Community Development and a Lee County commissioner from 1988 to 2012. Video of the event is available on LeLu’s Facebook page. Both the Siesta Chamber and the SKA invited Tracy Fanara, a staff scientist and program manager at Mote Marine, to educate their members about red tide. The SKA presentation was scheduled to be part of that nonprofit’s regular meeting on Sept. 6, while Fanara spoke with Chamber members during their September networking breakfast. Tracy Fanara, one of the primary Mote Marine Laboratory researchers dealing with the red tide bloom, has had her share of media exposure over the years. However, when she appeared before Siesta Key Association members on Sept. 6, she made it clear that live TV appearances can be a bit nerve-wracking. That morning, she said, she was preparing for an interview on The Weather Channel. Just 30 seconds before she was to go on the air, she learned that she was going to be talking to two of that channel’s top personalities — Jim Cantore and Stephanie Abrams. Fanara earned widespread recognition when she was a member of the cast of MythBusters: The Search on The Science Channel. Still, Fanara was energetic and engaged as she made her presentation to SKA members and answered questions. In fact, she talked for more than an hour, with Vice President Catherine Luckner finally announcing just before 6 p.m. that the directors needed to wrap up that segment of the meeting. At one point, Fanara paused and then said, “I’m telling you guys a lot more than I typically tell groups.” She indicated that she attributed that realization to the fact that the audience members themselves seemed pretty knowledgeable about red tide and Mote’s research efforts. Regular readers may recall that Sarasota County Sheriff’s Office deputies responded on May 18 to the report of an apparent drowning of a visitor off Beach Access 2. The resulting Sheriff’s Office report noted that the daughter of the victim — Robert C. Kannady, 59, of Missouri — said that after about 10 minutes in the Gulf, he began growing fatigued and said he did not feel he could make it back to shore. A copy of the autopsy report was requested from the District Twelve Medical Examiner’s Office, to learn whether drowning was indeed the cause of death. The report, which was signed by Chief Medical Examiner Dr. Russell S. Vega on June 25, classified the death as an accidental drowning. The only injuries Vega detected were “[s]ome subtle, roughly longitudinally oriented scratches” on the man’s left forearm. The accompanying toxicology report showed no medications in Kannady’s system at the time of death. If you love Mexican food, it’s time to visit Plaza Mexico. Plaza Mexico is offering two discount coupons, $5 off for Dinner and $3 off for lunch. 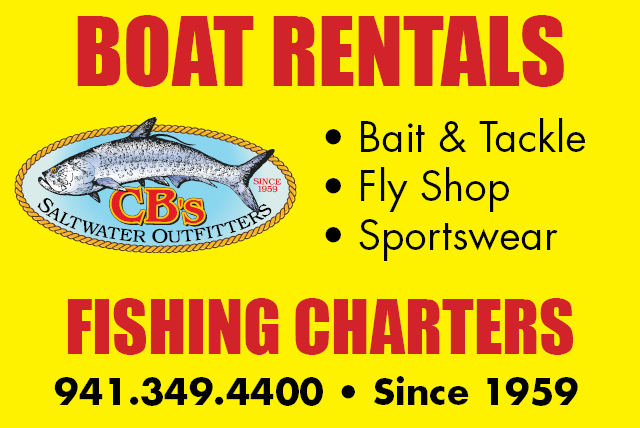 Take advantage of the coupons located on page 6 of this month’s edition. Plaza Mexico is located in the Southbridge Plaza, 1894 Stickney Point Road. With the Siesta Chamber preparing for the 2018 Crystal Classic International Sand Sculpting Festival, which will be held Nov. 9-12 on Siesta Public Beach, the Vendor Village already has been sold out, Chamber Executive Director Ann Frescura reported during the Aug. 15 members meeting. Maria Bankemper, whose family owns the Best Western Plus-Siesta Key Gateway hotel and who serves as the chair of the Crystal Classic, pointed out that this was the earliest that all the Vendor Village spots had been taken, Frescura said. The festival began in 2010. “That’s a good indication of the interest in that event,” Frescura added. Frescura also asked the meeting attendees to encourage friends and loved ones to volunteer.